Evita is back in Durban and in fine form, pulling no punches in exhorting South Africans of all races, cultures and social levels to pull together as one to get the country back on track and reclaim our precious democracy! Pieter-Dirk Uys does it again – inviting us to spend a delightful evening with Evita Bezuidenhout. This time there is a strong inspirational and motivational message behind his show, Evita Bezuidenhout & the Kaktus of Separate Development but it’s all beautifully woven into clever and often hilarious entertainment. Tannie Evita has received as much recognition and international acclaim as her creator! I remember the night all those years ago at the Elizabeth Sneddon Theatre when he packed Evita away, saying that now democracy had been achieved and we had a strong leader in Nelson Mandela, she wasn’t needed any more. The audience reaction that night was fascinating – gasps of horror as she slowly stripped away stockings, corsets, high heels, dress, wig, nails and make-up and packed them away into a case. It seemed as if they were watching a suicide. Well, Evita didn’t stay packed away in her case for very long. Announcing her return to public office as the ambassador to the fictitious homeland of Bapetikosweti, Uys said at the time that the government and its associates were providing fantastic comedy material and the opportunities were too good to lose. Since then, Evita has gone full steam ahead – many years of taking the mickey out of South African politics and politicians – always impeccably dressed, manicured and hair-styled. We meet her in this show as she enters through the auditorium making a desperate phone call to Gwede (ANC Secretary General, Gwede Mantashe) complaining that her props haven’t arrived for her Imbizo and what is she to do with a set covered with three step-ladders and a black stage curtain lying on the floor? There’s also a Julius Malema doll on one of the step-ladders and a carton which has some very interesting contents. Surprisingly now a proud junior member of the ANC, she’s not supposed to divulge policy but that doesn’t stop her! She also talks about Nelson Mandela’s love of plants, a possible sexual harassment moment by Donald Trump and discusses a number of books about South African presidents found in the carton. By interval, Evita gets a call to say that her set has arrived and so we move into the next phase of the show. Dressed to perfection in an elegant sequinned dress, she then proceeds to explain the props. There is a massive painting of the Battle of Blood River, a dilapidated piano with pictures of the Dromedaris, Jan van Riebeeck, Maria van Riebeeck and van Riebeeck’s arrival in Table Bay. On top of the piano is a large cactus. There’s also a shelf containing a pair of Dutch clogs, miniature ornaments of a Voortrekker-styled wagon, the Voortrekker Monument and a veiled item which is revealed later! She then proceeds to give her own version of van Riebeeck’s arrival and the history that followed. There is much talk of her culinary capacity and she proudly maintains that the diet she introduced to Luthuli House is working because you can now see politicians fitting into economy class seats! 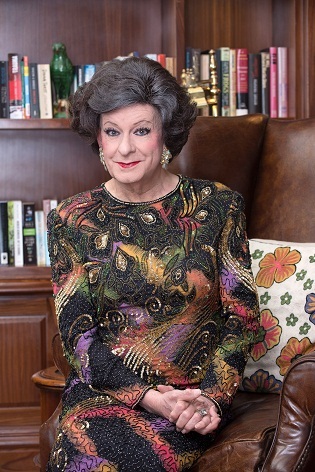 In amongst the humour and amusing stories, Evita Bezuidenhout & the Kaktus of Separate Development urges every single individual in South Africa to get involved and make a difference. As always, there are memorable lines such as “An overweight government under-thinks” and “Boerewors is haggis with a sense of humour” as well as the more serious statements that underpin her show: “Apologies are fine but are no use if you aren’t prepared to move on” and “Never think that freedom lies around waiting to be discovered”. There’s no chance of your attention wandering because Evita’s casual throwaway sarcasm is often as outrageous and hilariously clever as the rapid-fire delivery of the main script.